Four Points by Sheraton Juneau is located in the heart of Historic Downtown Juneau, just steps from the Seadrome Marina, the waterfront, and more. We're a preferred hotel of the Centennial Hall Convention Center and conveniently located near the top things to do in Juneau. 51 Egan Drive, Juneau, AK, 99801 Map It! Pearson’s Pond Luxury Inn & Adventure Spa Juneau’s top rated lodging experience offers loads of complimentary amenities designed to maximize your vacation enjoyment – from cozy fireplace rooms with eco-friendly fireplaces, to bikes, boats on the pond, and trip & wedding planning services. The Pond’s casual elegance, master-planned rain forest garden, and hospitality make it the perfect base for your Alaska adventure. Alaska B each Cabin Located in Juneau's coveted Indian Cove, this little beach house offers all the comforts of home with a million dollar view. Watch eagles soar and sea otters play from your own private beach setting. 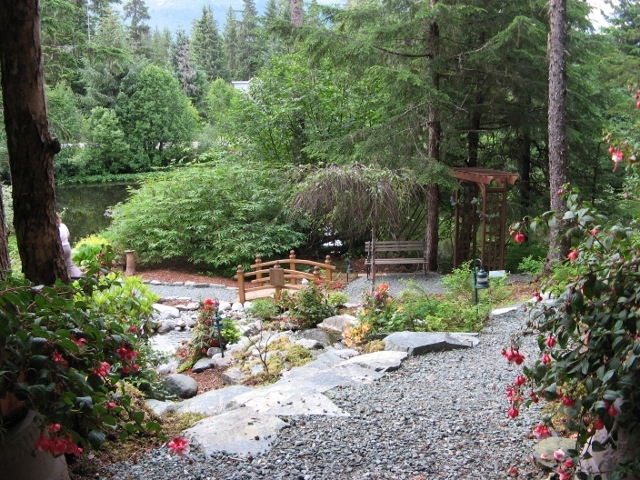 Full accommodations and privacy in a close proximity to all that Juneau has to offer. The covered porch allows for rain or shine comfort while enjoying the panoramic scenery around the cove. Your Alaskan hosts offer a lifetime of knowledge and experience to help make your visit enjoyable. Best Western Grandma's Feather Bed The Best Western Grandmas's Feather Bed, the smallest hotel in the largest hotel chain, is a Country Inn featuring 14 deluxe suites in a unique Victorian style Farmhouse. All suites at Grandma's are individually and uniquely decorated and feature lofty feather beds and in-room Jacuzzis. Prospector Hotel Located in downtown Juneau across the street from the Convention Center and next door to the Alaska State Museum. Suites, oversized Queen and King Rooms. Free courtesy van, premium Cable TV, internet access, coffee makers, microwaves & refrigerators. Home of T.K. Maguire’s serving Alaskan Seafood, choice steaks & much more. Silverbow Inn Charming boutique inn located in the heart of downtown Juneau. All rooms private bath, cable t.v, free local phone and WiFi. Jacuzzi, Sauna and bbq on guest roof deck. Hotel guests enjoy full breakfast from our gourmet bakery next door in private, antique-filled lobby. Cafe adjacent to hotel serves breakfast and lunch daily. Use our WIFI while sipping a beer on our outdoor deck or come in for delicous homemade soup with fresh baked bread. Westmark Baranof Built to rival the most lavish hotels of its day, the historic Westmark Baranof is located in the heart of downtown Juneau. Offering comfortable accommodations, elegant public areas, lounge, cafe & fine dining in Juneau's Gold Room Restaurant. Glacier Nalu Campground Resort Full service sites on the city bus route. Spotless showers, laundry, cable, WIFI, modem and tour information. Reservations recommended.